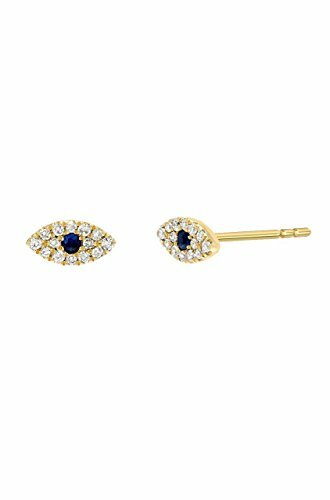 Beautifully handcrafted small evil eye stud earrings, with white pave diamond and a centered sapphire stones set in 14k solid gold color of your choice, uber chic and timeless. Made in L.A. Size of eye: Approx. 5mm. Carat diamond weight: Approx. 0.12(ct. tw). Ships in 3-6 business day. Comes gift ready in a beautiful custom jewelry box wrapped in a satin ribbon.